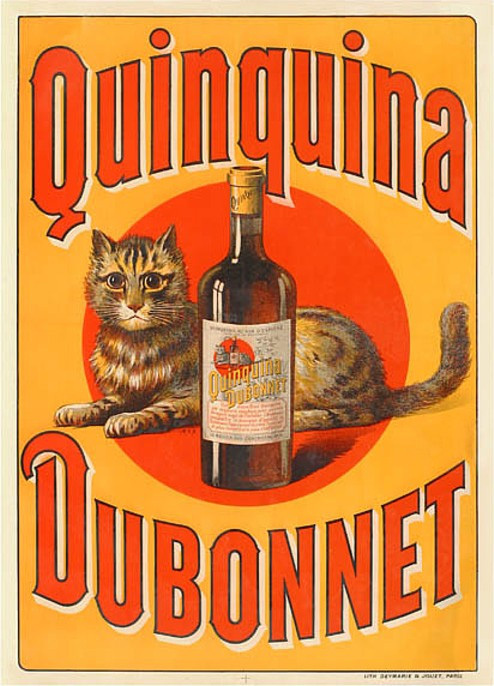 Quinquina Dubonnet was once an item imported to the U.S.A. from France. For a time it was the most important quina wine used in American bars. Quina wine (or quinquina wine) is an aromatized wine, and the sibling of vermouth wine. The general difference is that where vermouth wine must contain wormwood (vermouth in old German), quina wine must contain quinquina, or cinchona (cinchona officinalis or cinchona calisaya — natural sources for quinine). For a wine-less taste of cinchona, try some un-mixed cinchona bitters, such as Campari. Cocchi Americano is a currently well-reputed quina wine from Italy. In Italy it is called China Americano, china being Italian for quina (the word china was apparently too confusing for inclusion on the label in the U.S.A.). Old-formula Kina Lillet (kina being a re-spelling of quina) and Maurin Quina each have their secure places in history. RinQuinQuin is nice, if you can find it and want your quina wine also flavored with peach kernels. But Quinquina Dubonnet was once the venerable warhorse that always led the pack of quina wines. It is said that it was during the second world war that Dubonnet was licensed for production in the U.S.A. It is sure that the original item was, and still is, made in France. There have been murmurs throughout the decades that, contrary to claims, American-made Dubonnet just isn’t as good as French Dubonnet. I recently let some students taste the two, side-by-side and un-mixed. They all indicated that the difference was stark, and that the original French Dubonnet was better. Dubonnet from France is deep red in color. Its flavor is that of a moderately sweet wine with hints of fig and a noticeable cinchona mid-and-after-taste. It is lovely and would be fine for un-mixed use. Dubonnet from the U.S.A. is pale red in color. To me, its flavor is that of stale wine with a little non-descript bitterness added. I would much prefer Dubonnet from France. I go to the trouble of obtaining it and keeping it on hand. If so-called Dubonnet from the U.S.A. were my only option, I would skip using it altogether (including in mixed drinks). When tasting Dubonnet from France, it becomes clear why this became the default quina wine in American bars and showed up in notable drinks for a time. When tasting Dubonnet from the U.S.A., it becomes clear why so-called Dubonnet is no longer a must-have item in the American bar. Handling note: As with all wine-based products, the worst way of keeping any quina wine is to open it and then leave it untreated at room temperature. This allows oxidization and ruins the wine. Also bad is the refrigeration of quina wine or vermouth wine, in my opinion. I feel that storage under refrigeration irrevocably degrades the wine itself, and only slows oxidization without stopping it. The best option is to re-seal the bottle after opening with some wine preservative gas. This replaces the inert, heavier-than-oxygen gas that was in the headspace of the bottle as placed there by the manufacturer at the time of bottling. This is as close as one can get to preventing oxidization completely. Once open and then gassed, store your quina at room temperature and re-gas it each time after opening. Chanced on your post – I had no idea that not all Dubonnet was from France! I am not sure how you get your French Dubonnet, but if you are from the North-East of the US, you should note that the Dubonnet sold in Quebec is imported from France, so depending on your distance it might be an easy way to keep it stocked. We can get the dubbonet from France in Canada. I definitely agree it’s way way better than the American one. Just had the American version over Christmas, it was not tasty. In Canada, dubbonet is one of our cheaper alcohols, it is my drink of choice due to price and fruity (cherry) flavour. So glad I saw you post because I didn’t understand why the American version was so different.